Dwight Evans speaks during a Hillary Clinton campaign event at Independence Mall on Monday, Nov. 7, 2016 in Philadelphia. 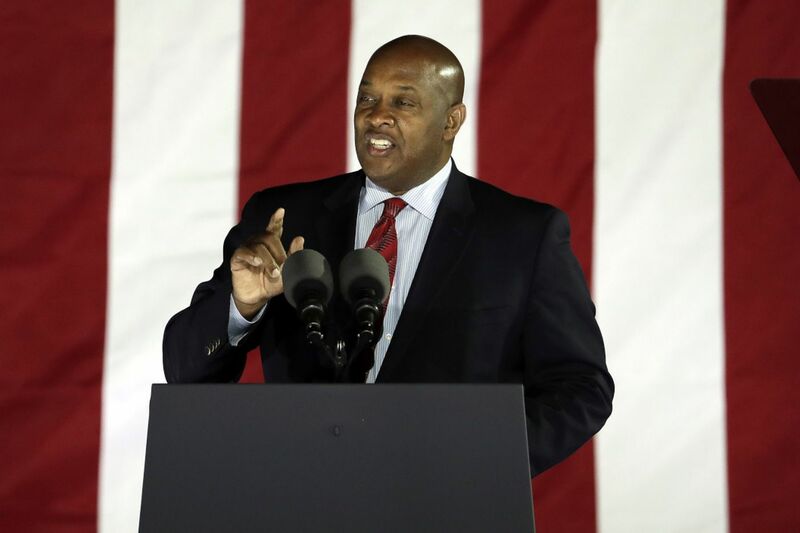 State Rep. Dwight Evans is headed to Washington. Evans, 62, who spent 18 terms in the Pennsylvania House, defeated Republican James Jones in an open-seat election to represent Pennsylvania's Second District, covering parts of Philadelphia and the lower Main Line, according to unofficial results. With 68 percent of the vote counted, Evans was leading Jones by a 12-1 ratio. He will take the seat held by Chaka Fattah for 11 terms. Fattah resigned on June 23 after being convicted on 22 counts, including racketeering, conspiracy, bribery, money laundering, and fraud. He will be sentenced Dec. 12. Because of Fattah's resignation, Evans was on the ballot twice, once for a special election to fill the seat until January, and once to serve a full two-year term. With his victories, Evans will take the seat immediately. Evans did not seek reelection in the 203rd District, which includes West Oak Lane, East Oak Lane, and Lawncrest. Isabella Fitzgerald, a longtime staffer for Evans, ran unopposed and will fill the seat. The Second District heavily favors Democrats, who make up 81 percent of the registered voters. The win is a significant rebound for Evans, who experienced a series of political setbacks after losing the Democratic chairmanship of the powerful Appropriations Committee in 2010, a post he had held for 20 years. That ousting came amid scrutiny over a nonprofit Evans founded, which mismanaged millions in state grants, and reports he had influenced the School District's decision to award a contract to a New Jersey-based nonprofit. Evans previously ran for mayor in 1999 and 2007, and for governor in 1994. "I'm excited about it," Evans said at his annual Election Day luncheon at Relish restaurant in Northwest Philadelphia. "I thank people for the opportunity. I served in the House for 36 years and I'm going to take that skill set of what I've learned to work toward the future. I'll work with Democrats, Republicans, whoever necessary to make a difference." Evans said he will focus on jobs, education, and neighborhood development. "Those things are very important to me and important to people I've been meeting with as I traveled throughout the primary," he said. Evans' early endorsements from Gov. Wolf and Mayor Kenney helped him greatly in his primary bid. He is Wolf's appointee on the SEPTA board, where he was credited this week with helping to broker a deal between the striking transit workers' union and the agency in time for Election Day. Jones, the owner of a human-resources consulting firm and Vietnam War veteran, ran unopposed for the Republican nomination.